Critical Kitten: Darth Vader Ants? I have developed a recent fascination with ants, which led me to the discovery of the so-called "Darth Vader" Ant. You can be the judge, from the pic above. They have this helmet-like structure around their head, and they have spikes along their bodies. Its a South American ant (where all the most developed and large insects come from), and has recently been discovered exhibiting gliding behaviour. 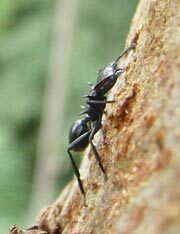 Apparently, if dropped from a tree, these ants can do a turn in mid-air and come back to the tree trunk. This supposedly protects them from falling to the forest floor (almost certain death), and allows them to find the branch where they nest. Neat. See the 4 minute video here and learn more here.